As if puberty isn’t awkward enough, each year about 3 million new cases of scoliosis are diagnosed in the United States. Scoliosis, the sideways curvature of the spine, shows up most often during growth spurts, usually when kids are between 10 and 15 years old. While the same number of boys and girls are diagnosed with minor idiopathic scoliosis, curves in girls are 10 times more likely to get worse and may need to be treated with braces. Coming at a time when pre-teen girls are self-conscious about body image, the idea of wearing bulky braces can be especially daunting for a kid who just wants to be normal. Enter Curvy Girls, a support group for girls with scoliosis. 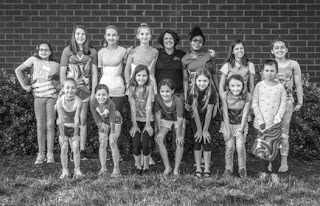 Led by girls who share the same challenges and concerns, Curvy Girl members meet regularly in Richmond to talk about anything they’d like. 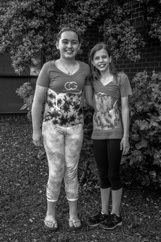 Ella and co-leader Marissa, also 12, met at a Curvy Girls meeting in Norfolk and are patients at Powell Orthotics and Prosthetics, where orthotist Beth Martin customized their braces. While scoliosis can be caused by conditions such as cerebral palsy and muscular dystrophy, the cause of most scoliosis is unknown. If you look at someone’s back, you’ll see that the spine runs straight down the middle. When a person has scoliosis, the backbone curves to the side. Anything that measures more than 10 degrees is considered scoliosis. The most effective treatment is with a customized brace. There are a number of different rigid-back braces available that vary in how pressure is applied to the spine and ribs to prevent a scoliosis curve from progressing. Some braces require full-time wear, typically 16 or more hours a day, while others are worn at night while sleeping. Given the impact of a brace on daily living, it’s helpful to have a support network for girls 8-18, Gates says. Gates and Wood also credit the support of Martin and the team at Powell. “They care about their people and they want them to have every opportunity,” Gates says. They encourage parents to have their children checked out during regular pediatric visits. A simple bend-over test can catch a problem early, especially if scoliosis runs in the family. “The sooner the better – in elementary school before growth spurts,” Wood says. Curvy Girls meet monthly at different locations. To learn more, please send an email to Richmond@CurvyGirlsScoliosis.com. Not every amputee is on the same path to recovery. races, though, it was just another challenge to overcome. But she quickly realized not everyone heals the same. amputations regardless of their activity level. Mission Gait, and his team. Mission Gait accepted the lead role in this unique first-time event. fishing, kayaking, wheelchair sports and much more. and students are welcome to attend for $10. Powell is proud to be a sponsor for the event. “Learning to live with limb loss is hard and leaning to use your prosthesis is harder,” she says. again with confidence – her idea for a hands-on clinic took hold. Powell’s Joe Sullivan will be among those participating on Belloso’s panel discussion. For more information and to register, please visit www.missiongait.org/events. Four years ago, Taylor Roberts, then a sophomore at VCU, was driving just a mile from her parents’ house in Powhatan when another vehicle rammed into hers, pushing her into a telephone pole. She suffered compression fractures in her lower spine – an injury that, for many, could lead to a lifetime in a wheelchair. But Taylor had other ideas. 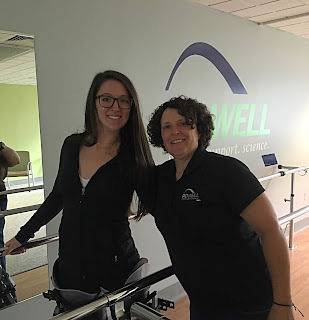 Upon the start of her out-patient rehab, she began working with Powell’s Beth Martin, a certified orthotist, on what would become an amazing recovery. Taylor started her recovery in a back brace following two spinal fusion surgeries. Once cleared of her restrictions, should would take her first steps since the accident in a reciprocating gait orthosis (RGO) brace that Powell made for her. Providing the necessary stability she needed at her hips, she used this brace for several months before progressing to long leg braces, known as KFOs. Taylor would be using these braces for the long haul. It wasn’t until she participated in a clinical trial using a powered walking device called the “Indego exoskeleton” that she would progress into the next phase of learning how to walk again. After the trial, Taylor began progressing into ankle braces with the help of physical therapy and the support of Beth and the Powell team. Now, with the help of technology, she’s about to take a big step. New technology is revolutionizing the capabilities of orthotics and prostheses. Taylor is a candidate for the C-Brace, a computer-controlled knee, ankle and foot orthosis manufactured by Ottobock that combines mechatronics (mechanical, electronic, computer, and systems design engineering) with custom orthotics to help people walk. The C-Brace opens up entirely new possibilities for users with its microprocessor sensor technology. Flexing under load while sitting down, navigating slopes, walking on uneven terrain, or going down stairs step over step, it can open a new level of mobility for those like Taylor. Small and light, the C-Brace enables the user to wear the orthosis underneath clothing. The unit’s microprocessor sensor makes the entire gait pattern more dynamic and responsive. With an eye on mobility, Taylor reflects on her injury and the support from family, friends and Powell to keep her spirits up. That includes finishing her degree at VCU. She’s studying journalism with hopes of possibly becoming an advocate for accessibility. And graduation in the near future. For Anna Clark Seibert, a first-year resident at Powell, it came from a university classmate, a Marine named Rob Jones, who lost both legs at or above the knee during combat in Afghanistan. 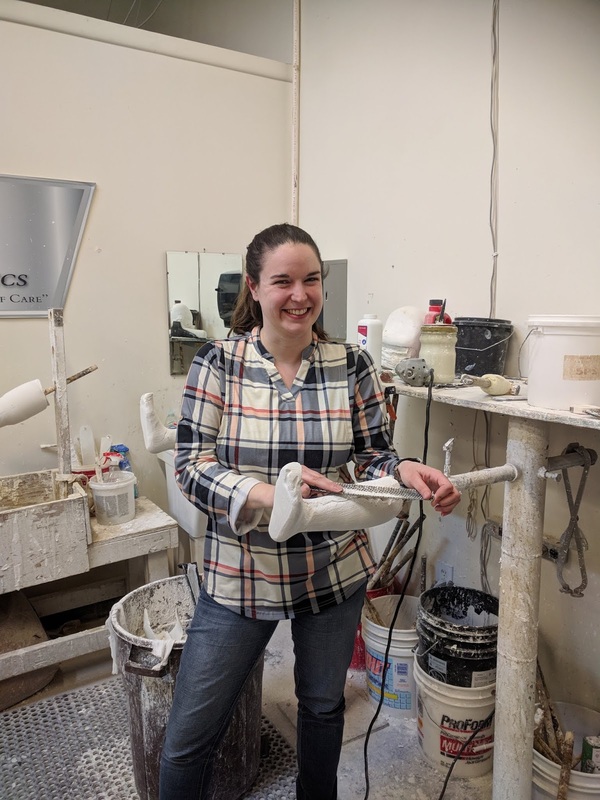 Anna, who was studying pre-med at Virginia Tech at the time, decided to pivot to a career in prosthetics. Anna is in the first of two years of residency at Powell – one for prosthetics, the other for orthotics. The program enables master’s-degree graduates a chance to work with patients, learn the business and prepare for the rigorous board certification exam. “I want to be as impactful as I can in the field I love,” she says. One step to that goal came March 6-9, when she presented an academic paper called “Prosthesis User Experience and Coping Strategies – a Social Media Content Analysis” at the 45th annual meeting of the American Academy of Orthotists & Prosthetists, a national organization. In the paper, she and co-authors conclude that social media content can help practitioners obtain a more detailed and unfiltered understanding of the interests and concerns that are prevalent within the limb-loss community. Support groups on social media sites such as Reddit and Facebook can be a valuable resource for patients coping with limb loss, albeit it with different information. The topic came from her own interest in documenting the role of social media to help patients and their families. “I was mostly curious about prosthetic life hacks but unfortunately I didn’t find a ton of them,” she said. In the process, she and her colleagues collected a year’s worth of data (1,305 posts) and coded the entries to get data points. Always on the lookout to help patients, Anna hopes to carry out future studies to ensure patients and their families have access to helpful information online at a trying time. Looking ahead, Anna says she’d love to work with children in part because she can see the same patients more as they grow out of equipment. In the meantime she’ll be greeting patients of any age at Powell. Losing a limb is a life-changing event. How much of an effect it has on your daily life depends on each individual and situation. For some, it’s just a momentary pause before life gets back to nearly normal, but for others it can be a dramatic change in lifestyle where every activity is somehow different. It’s not only the amputee who has to make changes, often family members, friends and caregivers – even coworkers – must adapt as well. If you are an amputee, you’ve likely found ways to adapt your life, whether it’s through a prosthesis or other means or a combination of both. If you’re a recent amputee, we’ve gathered a few items and ideas that will help you in the days and months to come. Thick Leggings: The thick material holds up better against wear. If they do happen to wear, a quick stitch or two fixes the problem. Elastic shoelaces. These little miracles stretch so your foot can slide into the shoe without loosening the laces. Clear pathways. Navigating a cluttered stairway or overflowing garage may not have been such a big deal before, but as an amputee, you’ll want to have a wide, clear path for navigation to prevent tripping and falling hazards. Pant clips can help single-handed people who find it hard to pull up pants and underwear. Clipped to the front of paints, they can be removed and tucked away for later use. Daily living accessories such as voice-controlled lamps, light switches and phones, doorknob-turners, button aids (picture), dressing sticks (picture), one-handed cutting boards – you would be amazed at the variety of aides available today. Velcro can be used in a variety of ways to assist in daily activities. 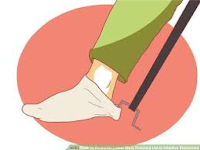 Many use it on the bottom of their prosthetic foot to keep on any kind of dressy flats, sandals, flip flops or other shoes that don’t tie, in place. Iron on reinforcement patches secured to the inside of pants can help keep the socket from rubbing away at the material. 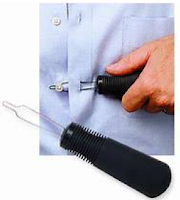 Bra fastening adapters can help those singled handed ladies with the nearly impossible task of fastening a bra. Life after limb loss is all about finding ways to what you want, in the best ways that work for you. You may not be able to do things the same way, but with some adaptation, you’ll eventually develop systems and habits to function and get the tasks accomplished. Have you discovered your own trick to make life easier? If so, drop us a note and let us know. Patients are able to find local support on the website and local leaders within their own neighborhoods. 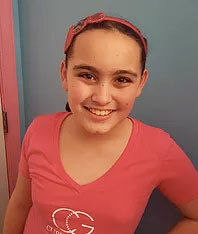 In the Richmond area, Marissa and Ella are Curvy Girl leaders excited to connect with new friends. Marissa is 11 years old and excited to be a Curvy Girls' Leader. She was diagnosed with scoliosis in June 2017 and began wearing a Boston Brace in August 2017. She wear it for 16 hours a day, even though she says it is “SO uncomfortable!” She did get used to her brace and now enjoys acting, musical theater, singing, playing piano, dancing, and hanging out with friends and family. 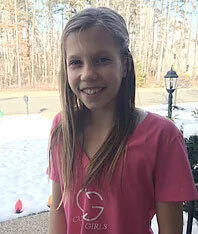 Ella is 11 years old and loves staying active in sports and with her friends. Her favorite sport is gymnastics, but she also plays soccer, dances and is on the swim team. She was diagnosed with scoliosis in August 2017, the summer before her 5th grade year. Her curve was at 20 degrees and she was told she needed to wear her back brace 18 hours per day. She has 2 sisters and is in the middle sister. Both Ella and her younger sister were diagnosed with scoliosis at the same time. Her younger sister is 8 years old and has a 25-degree curve. Both girls feel blessed to have a sister to share their journey. She is excited to be co-leader with Marissa of the Richmond area Curvy Girls’ group. Her hope is to carry on the positive message and support that she has received for many girls in the area. Then e-mail Marissa and Ella for location.